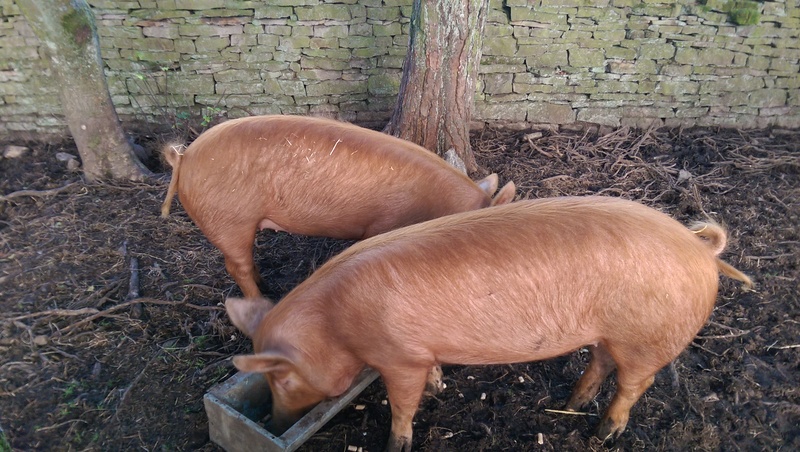 After a busy weekend which culminated in the delivery of the 2 pigs to the abattoir on Sunday morning, it was a pleasant distraction to see that the promised article about our set-up actually made it into the paper. There was a nice article in the Sunday Sun – a sister paper to the Newcastle Chronicle and Journal – and I thought that overall they really captured the essence of our adventure. Any inaccuracies in there were probably more as a result of my garbled explanations if I’m honest. I’m now waiting for the phone to ring endlessly with other media enquiries and wondering whether I should get an agent for the book deals that are bound to come along in due course! Life continues though and the 2 remaining pigs are slowly adjusting to the quieter surroundings in their pen. Mealtimes are certainly much more relaxed when there’s only 2 faces in the trough! Very exciting that you have been featured in the press. Do you have any top tips for someone wanting to follow your path? The more we do here the more we realise that, while there are always similarities with other smallholders, everyone has different ideas or expectations. Just plan ahead a little, try a lot of different things and then stick with the aspects that work best for you!